Written on December 31, 2008 by Kevin. Written on December 26, 2008 by Rylan & Kaitlyn. Wow Kaitlyn and I sure made out this Christmas. We had so many gift opening events and dinners it was hard to take them all in. We started last Sunday at our cousin Hayden's house. We gave him some handmade items and his soon to be sister as well. We got some great things too. My grandma and grandpa got my Dad and I matching slippers. They are clogs and we sure look funny in them. Christmas Eve was celebrated with our mom's father's side of the family. I think my favorite gift were the numerous remote control cars that I got. They are really fun. Kaitlyn got a bunch of movies and even a dog Wii game. She is going to have a lot of fun with that. On Christmas Day we were awoken by our Grandma. She definitely surprised us. We headed downstairs to start opening all of the gifts. There are so many great things that we received it's hard to tell you them all. When we were all done opening the gifts, dad surprised us with one last big gift. It was a gift for both Kaitlyn and I. It was a cooker! I had been asking for one of these all year! Our very own kitchen. Now we can make mom and dad cookies and sandwiches and a whole bunch of other foods. Kaitlyn and I love it. We wrapped up Christmas evening by heading over to Grandma's house. We opened even more gifts while dad cooked a big meal. It turned out well even though I didn't eat any of it. Kaitlyn sure liked it though. Papa Fredrick and Grandma Tina showed up as well and that was nice. Overall it was a super great Christmas. How fast does the next Christmas come? I cannot even concentrate on what we may have done this week other than celebrate the holiday. We have been a busy bunch though. We hope everyone's holiday went as well as ours. Have a great weekend everyone. Written on December 23, 2008 by Kevin. Written on December 22, 2008 by Kevin. Written on December 19, 2008 by Rylan & Kaitlyn. Well this week hasn't been too eventful for either of us. We have just been preparing for Christmas that's coming up and just making sure we have everything needed. Mom has been treating Kaitlyn and I to some new things lately. With her new sewing machine she has been making cute things for the both of us. We are so proud of her and proudly wear everything she makes. She has made our Christmas outfits this year and a really cute outfit for Kaitlyn to wear this Sunday when we celebrate Christmas with part of the family. I think our cousin Hayden will really like his gifts a lot. Let's see... We have our final craft show for the season tomorrow. Hopefully people will want to pick up a few quick stocking stuffers at our table. I know Kaitlyn sure loves her bows a lot. She even wakes up in the morning and asks for her bows. Oh speaking of Kaitlyn, with the money she has made from the Christmas poops, she bought a pair of twin dolls. It's a boy and a girl. I tried to talk her out of them but she insisted. She loves those babies so much. She is definitely a girly girl. Oh I almost forgot.. I turned around last night and I saw dad sewing. 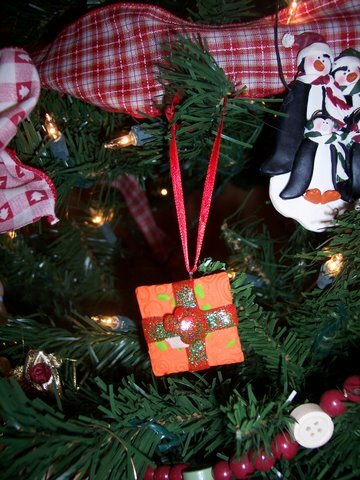 In fact, per our request he sewed mom a special Christmas gift. He was sewing someone else a special gift though this time. I don't want to give it away but I think that this person will really appreciate the gift and be amazed at his work. Who knew my dad could sew? We did! He's our dad and he can do anything! 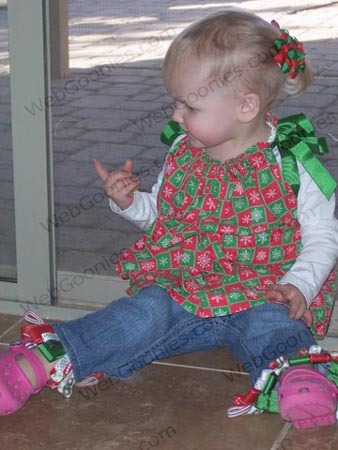 Oh Kaitlyn is trying to pick at the gifts under the tree. I need to stop her. That's gonna wrap it up for the week. Have a great weekend and happy holidays everyone. Written on December 18, 2008 by Kevin. 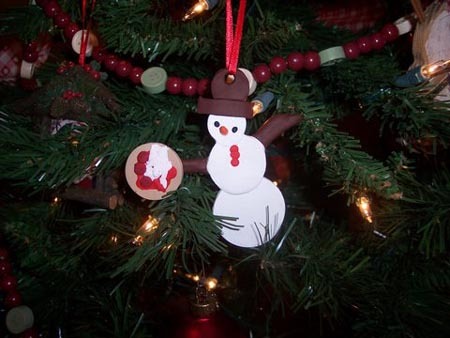 Rylan and his mom sat down last week to make these ornaments for our Christmas tree. 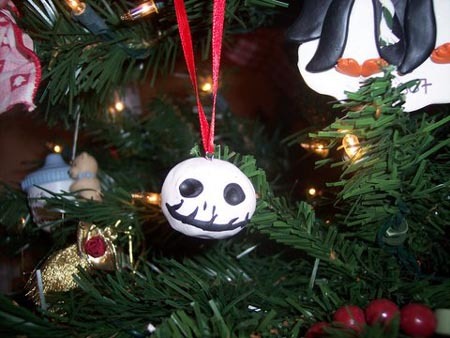 They are made with polymer clay and with just a bit of guidance from his mom, this is what he came up with. Have you ever seen a snowman holding a pizza? Now you have. Written on December 17, 2008 by Kevin. Written on December 16, 2008 by Kevin. At this moment, 199 comments (increasing quickly) have been written on the NY Times article about this topic. Some people think we are crazy that schools are being asked to make minor changes such as removing nuts entirely. They seem to all believe that the child with a severe allergy can manage his own and prevent any problems. Do you honestly think you can trust a 1st grader to carry around an epipen at all times and make sure to ask everyone that gives them food what the ingredients are? This is ridiculous and shows just how small minded some people can be. Can you put trust in all of the other children to make sure that they don't purposely or not, spread peanut butter onto another child. Depending on the severity of the allergy, the mere dust of a peanut can cause anaphylactic shock. This is a very fast acting problem as it can swell your throat shut very quickly. Do you expect a child to administer the epipen to themselves? Do you trust that if a child has a reaction, that another child would know the signs and tell someone which then would have to run to the nurse to get an epipen. Death comes in minutes, not hours. This issue is really not worth discussing. It is what it is. Peanuts are poison. Would you want poison so close to your child? I would think not. For a moment, think outside of your little world. Think of this minor change as an inconvenience but not worth getting worked up about. Think of all of the parents in the world that have to deal with a child with an allergy that could kill them. Every meal that my family eats has to be thoroughly examined. You try doing this for a week, let alone a lifetime. Written on December 12, 2008 by Rylan & Kaitlyn. Well we will start with last weekend. We went to another craft show at our dad's old elementary school. It had been yeears since he had gone back to see it and he said everything felt so tiny. They made a lot of changes but something remained the same. He showed us an old art project he did that was still on the wall from 15+ years ago. We had a chance to play on some of the old playground stuff that he played on. It was fun. They brought in snow for the kids but that was just crazy. There were big kids and adults throwing snowballs as hard as possible. We quickly grabbed a handful of snow and ran away. It melted before we could get back to mom to show her. The craftshow turned out really well. Potty training is a thing of the past. I am now a big boy and I even use the public potty with mom or dads help. Kaitlyn has been picking up on it all and the other night she sat on my potty. She didn't want to get off of it. She looked super cute. Maybe she will be ready soon and we can get rid of diapers all together. Oh, the other night our dad made a super good dinner. Quinoa Beef Burritos is what he calls them. They have beef, quinoa, black beans and tomatoes in them. They were super tasty. Both Kaitlyn and I ate it up. In fact, I ate mine so well that I asked for seconds and gobbled it up. I think it will be a new meal on the menu. We can't say enough good things about quinoa. 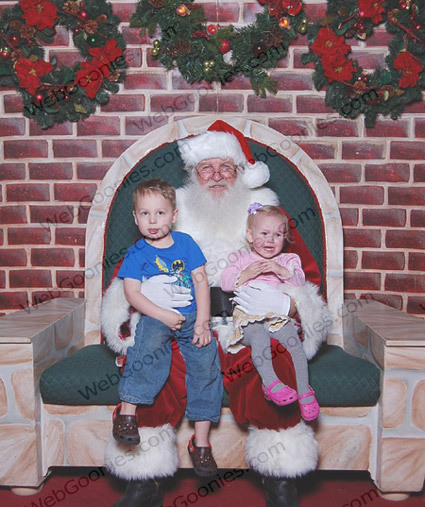 Yesterday after dad came home from work, we headed out to the mall to see Santa. I was pretty excited to see him but when it came down to sitting on his lap I was a bit nervous. I don't think Kaitlyn knew what we were in line for and when Santa was in front of us, she wasn't going for it. She cried and cried. She was so nervous that she tried to soothe herself by sticking her finger in her nose. It was funny. As for me, I stuck my tongue out the entire time I was on Santa's lap. Mom and dad were quite confused. Kaitlyn was shaking after we were finished up. I wasn't too interested in telling him what I wanted but he knows. Kaitlyn and I really want a cooker to play with. I think he will come through with it. That about wraps it up. Have a good weekend. Delgo movie worth looking at.. Written on December 9, 2008 by Kevin. 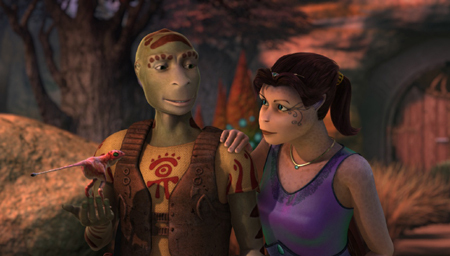 I was recently introduced to a new movie Delgo and checked out the trailer. It is a kid's movie but looks like it would be OK for the whole family. The faces of the characters look odd and possibly difficult to look at for a few hours but the story itself doesn't look bad at all. It has a lot of well known actors/actresses that are doing the voices (Freddie Prinze Jr, Jennifer Love Hewitt, Anne Bancroft (in her last performance), Val Kilmer, Michael Clarke Duncan, Chris Kattan and more). Watching movies with 2 kids can be difficult so I don't think we will be seeing this in the theatres but I think it will be a good one to rent in a few months. Written on December 8, 2008 by Kevin. 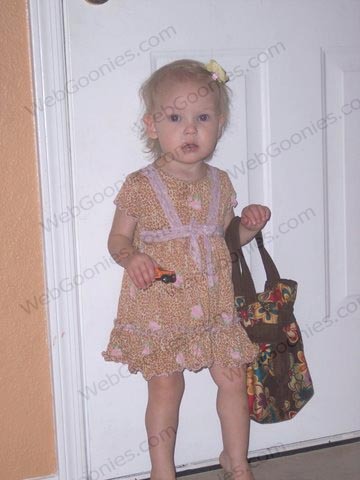 Here is Kaitlyn ready for a day out shopping with mom. She is modeling her flower clip and smaller version of her mommy's purse. Her mom made it from a pattern by Karlee Fuchs. She is such a girly girl. Written on December 5, 2008 by Rylan & Kaitlyn. Well last weekend was the big shopping weekend. Dad stayed outside of Target all night to get a few things. He was the 5th person in line and never really went to sleep that night. He looked pretty dead in the morning. Speaking of shopping, my mom had a huge craft show that weekend as well. As expected, the shoppers weren't there because of everyone's money problems. I think they did ok though, just not as well as they would have wanted. We have another one this weekend so we are hopeful it will be a good one. Kaitlyn and I will be selling our Christmas poops this time so that should be fun. We tried to go to our little downtown area where they were having an event going on. It was so packed that we drove around for 20 minutes and never found a place to park. We ended up parking at the chocolate factory about a half mile away. I got to choose a few things and dad bought a chocolate covered jalapeno. He has had one before but this one was really spicy because he was having troubles. He was even having hiccups. It was funny. The rest of the event was pretty good. Kaitlyn had a lot of fun watching the dogs. There were so many of them. Oh how could we forget. Kaitlyn and I have been eating the special cookies that Grandma Debra made for Thanksgiving. They were perfectly safe and perfectly yummy. Mom knows the recipe so I think we will be asking for these more often. Yum Yum. Christmas is only 20 days away. We cannot wait! Mom put the tree up the other night and when we came downstairs in the morning, Kaitlyn and I were shocked. We sat next to it for hours before we decided to move elsewhere. She did a really good job and we can't wait for it to be filled with gifts for good boys and girls. I think we are on that list. Written on December 3, 2008 by Kevin. We covered our tables in brown paper for the kids to draw on as a decoration for our Thanksgiving day feast. 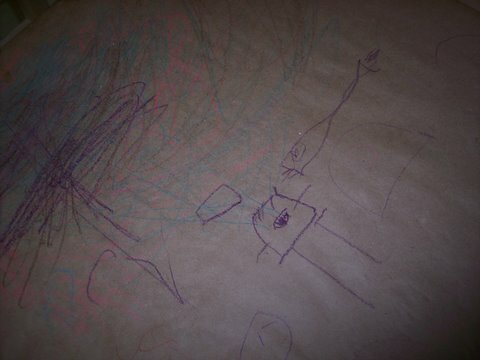 Kaitlyn enjoyed scribbling while Rylan showed off his new skills by drawing monsters everywhere. He went from scribbling to drawing full featured monsters over night. He can't stop drawing them now. He especially likes to draw them with one eye, similar to Muno on Yo Gabba Gabba. It is fun watching him concentrate as he draws every little detail including the tiny hair. Written on December 2, 2008 by Kevin. Kaitlyn and Rylan seemed to have a great time for Thanksgiving. We had a full meal at our place this year including foods that were all safe for Kaitlyn. Everything went very well and the food tasted great. Not a single trouble with the turkey despite it being our first. In fact, for being first timers making the entire meal, we did very well. 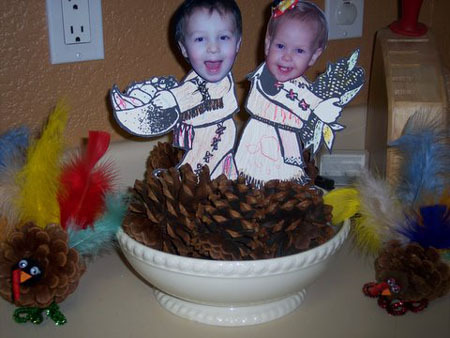 Kaitlyn and Rylan helped decorate for the holiday with these pine cone turkeys and their faces on some printed our figures. Everyone loved them. We covered the tables in brown shipping paper and let the kids draw and color their hearts out. They loved it. I will be featuring a photo of their artwork tomorrow. Without any training, Rylan has really taken to the artwork and his skills are showing. Written on December 1, 2008 by Kevin. ** Disclaimer ** This post may be gross to some. Rylan is now wrapping up his second week of being potty trained. 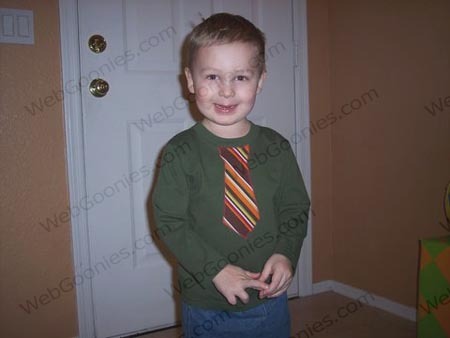 It was very clear that he was determined to master the skills and he has shown us that he is a big boy now. We ran into a sick day a few days after starting and then last week he went through a day where he just didn't want to go but otherwise things have gone very very well. He seems to have very good body control and when we are driving down the road and he tells us that he needs to go potty, he is able to hold it until we either pull over or end at our destination. There are times when he knocks it out right when he gets on the pot, and others when we are sitting there for 10 minutes without a drop. Then there are times like Saturday night. All of us took a trip down to a nearby event and on our way back Rylan explained that he needed to go poop. This was great to hear because he doesn't seem to like to go and seems to hold it in instead. In fact, he went about 4+ days without going poop so when we heard that he needed to go, we rushed back to the car. Rylan though wasn't in a rush. I set his potty in the front seat as usual, plopped him down and let him work his business. I'll just say that he went 4+ days without a poop but Saturday night was the night to let it all out. As I stood outside the car with the doors shut and my wife and Kaitlyn inside with him, he dropped 10 poops in 30 minutes. As I opened the door to check on him, he would tell me to shut the door because he wasn't done. I gladly did it because the insides of that van smelled so badly. I could only laugh at the 3 of them stuck in there.